Sure, this A.1. 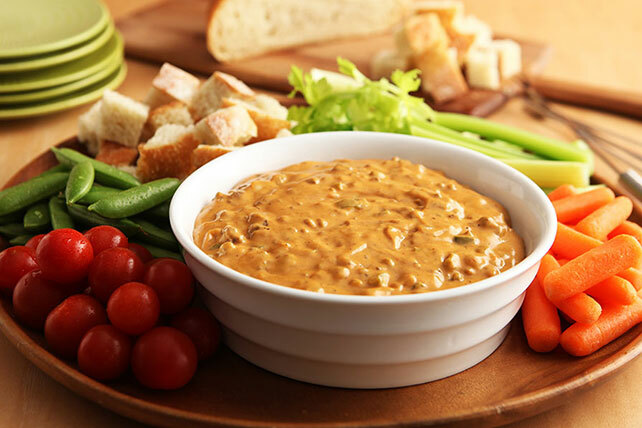 Cheesesteak Dip is so cheesy and delish you'll want to eat it with a spoon. Resist: It's best served with veggies and chips. Brown meat in medium skillet; drain. Return meat to skillet. Add peppers and onions; cook and stir 4 min. or until crisp-tender. Stir in remaining ingredients; cook 10 min. or until VELVEETA is completely melted and mixture is well blended, stirring occasionally. Serve with Italian bread cubes, tortilla chips and/or assorted cut-up fresh vegetables. Cook vegetables with browned meat as directed; spoon into medium microwaveable bowl. Cool. Refrigerate up to 24 hours. When ready to serve, stir in remaining ingredients. Microwave on HIGH 8 min. or until VELVEETA is completely melted and mixture is well blended, stirring after 4 min.